Trees to 40m; trunk to 0.9m diam. ; crown spirelike. Bark gray, thin, smooth, with age thickening (to 18cm) and breaking into deep longitudinal furrows, often revealing yellowish inner periderm, appearing 'corky.' Branches diverging from trunk at right angles, the lower often spreading and drooping in age; twigs mostly opposite, glabrous or with yellowish pubescence. 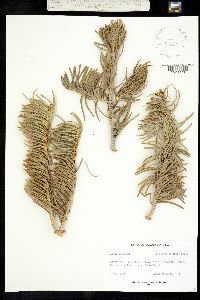 Buds exposed, either yellowish and nearly conic (when large) or brownish and nearly globose (when small), resinous, apex rounded to pointed; basal scales equilaterally triangular, glabrous, not resinous, margins entire, apex sharp-pointed. Leaves 1.5--6cm ´ 2--3mm, mostly 2-ranked, flexible, proximal portion ±straight; cross section flat, sometimes slightly grooved adaxially; odor pungent, frequently camphorlike; abaxial surface glaucous, with 4--7 stomatal rows on each side of midrib; adaxial surface grayish green, glaucous, with (7--)12(--18) stomatal rows at midleaf, these usually fewer toward leaf apex; apex usually rounded, sometimes acute or notched; resin canals small, near margins and abaxial epidermal layer. Pollen cones at pollination ± red, purple, or ± green. Seed cones cylindric, 7--12 ´ 3--4.5cm, olive-green, sessile, apex round; scales ca. 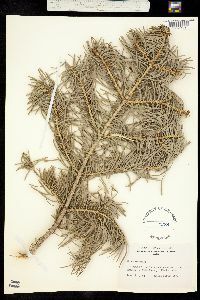 2.5--3 ´ 3--3.5cm, pubescent; bracts included. Seeds 8--12 × 3mm, body tan; wing about twice as long as body, tan with rosy tinge; cotyledons 5--7. 2 n =24. 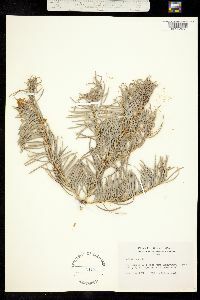 Coniferous forests; 1700*--3400m; Ariz., Calif., Colo., Idaho, Nev., N.Mex., Oreg., Utah; Mexico in Baja California, Sonora. *Specimens in Oregon have been reported in the range of 400 to 800 meters. In northern Utah, scattered low elevation trees have been found in Salt Lake and Utah Cos. in the range of 1475 to 1525 meters, and in the southern half of the state, there are records of trees in San Juan and Washington Cos. in the range of 1225 to 1300 meters. Abies concolor is a western catchall species for firs with green seed cones and with glaucous adaxial leaf surfaces. Many of these populations have long been isolated geographically and genetically. A geographic cluster of populations in Utah has shorter leaves and slightly different terpene patterns than a similar cluster of populations in Colorado and northern New Mexico (J.W. Wright et al. 1971; E.Zavarin et al. 1975). Another large geographic cluster, in southern New Mexico and Arizona, seems to be strongly linked chemically to Colorado populations (E.Zavarin et al. 1975) and morphologically to southern California populations (J.L. Hamrick and W.J. Libby 1972). Northern California populations with pubescent twigs and notched leaves are unique, as are the Baja California populations with very short, thick leaves and about 18 adaxial stomatal rows. In Los Padres National Forest of coastal southern California and in the Cascades of northern California, apparent introgression with A . lowiana (E.Zavarin et al. 1975; J.L. Hamrick and W.J. Libby 1972) has occurred. 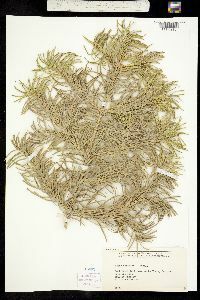 Many consider A . lowiana (given specific rank in this treatment) as a synonym of A . concolor or place it in an infraspecific rank under that species.